After A Tragedy, Companies Want to Help – Right? – the ajayi effect. After A Tragedy, Companies Want to Help – Right? In the wake of the tragic Boston bombings, there were numerous individuals and companies that sprung into action to answer the question of, “How can I help?” While I understand it is in the spirit of being an American to come to the aid of our neighbors when they are most in trouble, I wondered about the channels that were being formed to facilitate just that. It is not unusual to hear about millions of dollars being donated in the wake of a major hurricane or earthquake and then discover that years later, those who most needed the help, are still suffering. It is apparent that the old system isn’t serving us well. A recent HBR article echoes my sentiments and goes even further. 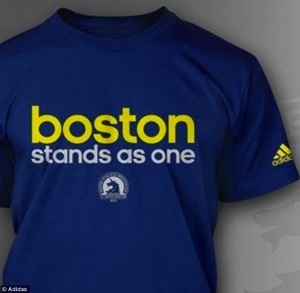 After what happened in Boston, Adidas provided a focus by creating the Boston Stands As One tee-shirt. The product sold out within a day according to Businessweek. Through the sale of this shirt, Adidas donated more than $1 million dollars, a company spokesperson told the Huffington Post. Why create the t-shirt and not simply give a donation? With a market cap of $21 billion and more than $2 billion cash on hand, it’s not like Adidas couldn’t give the money themselves and take the accompanying tax write-off. In the end, each individual company needs to think long and hard about their own expertise and how they might use it for good after this tragedy and others. Now is not the time for gimmicks; it’s the time for tangible, transparent help that actually makes a difference. WOW! I must admit, she is right on the money with this one. There’s got to be a way when it comes to companies responding to tragedies. Read her entire article, here. True ROI and a Week to Care About it.